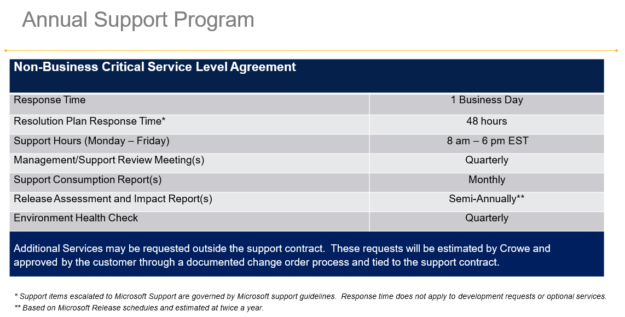 Some companies that purchase Microsoft Dynamics 365 think that Microsoft Premier Support is the highest level of support available. Until they compare the benefits side by side. 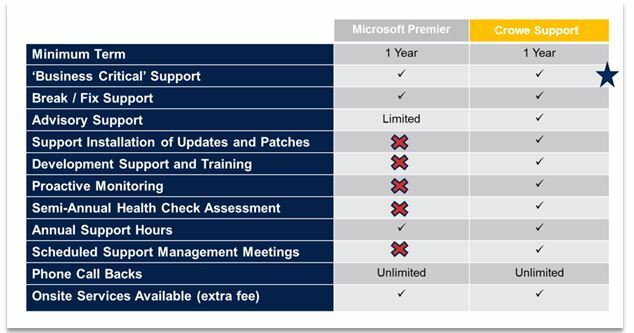 Crowe can provide your company a better alternative to the Microsoft Premier Support plan. We offer extra services, focused on proactive measures and strategy, to save your company money in the long term. All for a set predictable cost. 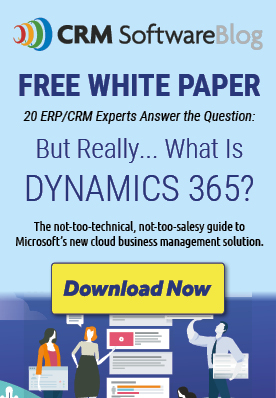 From a team of 40+ professionals that work with Microsoft Dynamics 365 every day. Crowe is a Gold CRM, ERP and Cloud (Azure) Partner with Microsoft and a Tier 1 Cloud Solution Provider with Microsoft. We have our own Premier-level direct contracts with Microsoft. So if there is an issue that requires Microsoft assistance, Crowe has the fastest and most direct channels to facilitate this. We are able to offer you personalized support from a team that has a deeper understanding of your business and system. Microsoft Premier support is not your only option. Crowe managed support services proactively monitor, support, and enhance your Microsoft Dynamics 365 deployment to ensure you are getting the most from your technology investment. Find out more about Crowe Managed Support on Appsource. If you are interested in discussing a support plan for Microsoft Dynamics 365 (formerly Microsoft Dynamics CRM), contact us today. How Do Crowe CRM Consultants Sharpen Their Skill Set?